Gyms are gross. Lots of sweat, lots of grime. And the smell – oh my. Spritz those machines all you want, but you can’t get rid of it. It’s driving you crazy. Your clients are getting sick and not coming back. What’s the problem here? 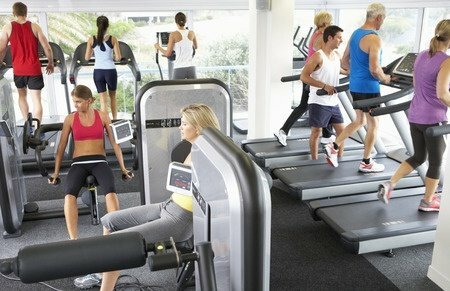 Take a look at your gym flooring. If it’s made of rubber sheeting or tiles, chances are it’s the culprit. Rubber floors are like sponges; they’re porous and hard to sanitize. Rubber flooring is made by gluing together a ton of little rubber “crumbs”. This type of flooring is installed by a process where sections of material are glued to the floor and welded together at the seams. Over time, high traffic, dropped equipment, and constant friction will pull those seams apart. Once that happens, air starts to build under the sheeting and dissolve the glue which adheres it to the concrete substrate. Evaporating glue can release toxic compounds and pollute the air quality in your building. And now you have dark, moist pockets building up right under your feet. Bacteria and pests don’t need an invitation! Everlast® Floor is a healthy alternative for all your flooring needs. It adds an extra level of protection to an existing floor surface, creating an impermeable membrane which, with proper care, will last a lifetime. Able to handle the wear and tear of foot traffic and heavy equipment, the Everlast Floor is composed of a watertight resin that adheres to any surface (no plastic glue needed!) and will never crack, chip, or flake. Best of all, the non-porous design has a zero-tolerance policy for bacteria, fungi and pests. Cleaning is a breeze; all you need is soap and water! You can disinfect it easily, and it dries with lightning speed. The Everlast floor is made with a safe, environmentally friendly FDA-approved ingredient containing antibacterial properties. Our flooring has been used in hospitals, veterinary clinics, schools, restrooms; anywhere requiring fast and effective cleanup. With no pores for fungi or yeasts to hide, any mess can be quickly wiped away. Say goodbye to loose rubber floors and bacteria breeding grounds in your gym or fitness facility – permanently. Get your Everlast Floor today by calling 1-(800) 708-9870, or click here.